Scooby and the Gang are back in Scooby-Doo! Mystery Mayhem. Join your favorite slackers as they try to solve a mystery of supernatural proportions. The gang starts out on a routine case in the search of ghosts. During their search, a scheming business tycoon, who will stop at nothing to grow his empire, uses the Tome of Doom to unlock some of the creepiest monsters our gang has every seen. 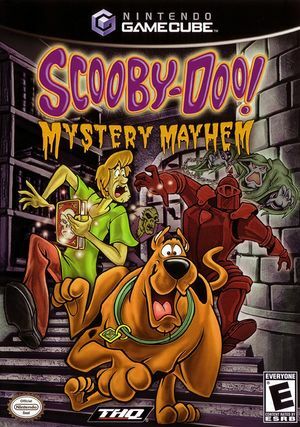 Help Scooby and Shaggy find the Tome of Doom, capture monsters, and solve the mystery. Would you help Scooby and Shaggy solve this mystery for a Scooby Snack? The games save mechanism may not be working properly. Loading saves results in memory errors, but they can been ignored by disabling Panic Handlers. Later in the game new chapters may fail to load. This can be addressed by enabling "Speed up Disc Transfer Rate". The following AR code will make the game run at 60FPS instead of 30. The graph below charts the compatibility with Scooby-Doo! Mystery Mayhem since Dolphin's 2.0 release, listing revisions only where a compatibility change occurred. This page was last edited on 18 March 2019, at 08:13.